This form captures information for our Festival of Fine Craft Artist mailing list ONLY. It is not a show application. Applications will be sent out annually in mid-January and will be due mid-April. Festival of Fine Craft Jury will be held mid-May and notifications will be sent out prior to June 1. The Festival of Fine Craft, now in its 21st year, is our premier annual event and one of the most highly rated shows in the Mid-Atlantic region. Named one of Sunshine Artist's 200 Best in 2018, this campus-wide event continues to grow in attendance, programming, and quality overall. Approximately 150 exhibitors, ranging from new & emerging artists to masters in their mediums, are carefully selected by a jury of WheatonArts professionals and experienced staff artists. We take pride in maintaining an artist-friendly show with a high standard of quality, and are continually working toward a balance of mediums, styles and techniques. 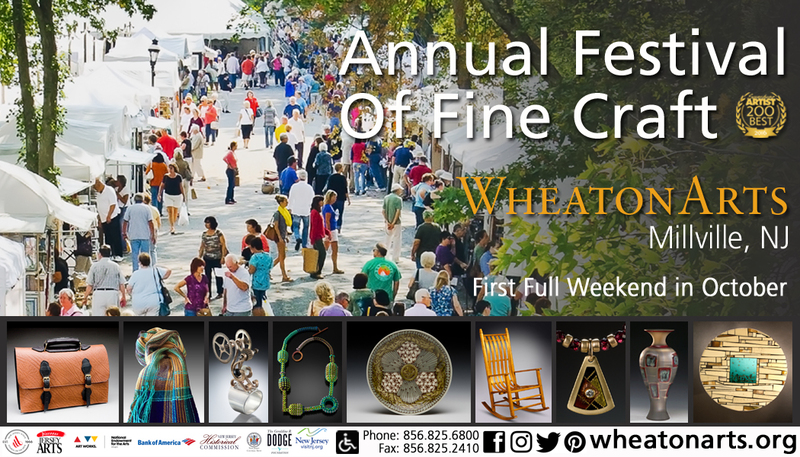 WheatonArts provides convenient day-before set up, overnight security, booth sitters, and unequaled hospitality throughout the show. Lodging at reduced rates are offered to exhibitors at some nearby hotels. Open Studios, craft demonstrations, live music, exceptional food, and a variety of interactive activities add to the excitement, making the festival both entertaining and educational. Our comprehensive marketing plan includes extensive print, radio and electronic media campaigns, full color publicity and year-long promotion through our other events and outreach programs. • The Festival of Fine Craft is open to artists working in all mediums who design and produce their own work. Exhibiting artists must be present. • No commercially mass produced items will be accepted. No imports, items made from kits, or items using commercial patterns or molds may be displayed or sold. • The festival provides space only. Artists are required to furnish and install booth walls, booth lighting and display units. • Please note that images of your work and booth space will be required at the time of application. We ask that all digital images be in Hi-Resolution JPEG format. Indoor and Outdoor booth spaces are available. Fees range between $300.00 to $425.00 depending on booth selection. Discounted booths may be available for artist willing to demonstrate their craft. Please check "Yes" if you would be interested in demonstrator opportunities. Yes, please send me information on demonstrating during the Festival of Fine Craft. No, please send me the exhibitor information only. Thank you for your interest in exhibiting at the Festival of Fine Craft! Your information will be added to our mailing list for the upcoming year.